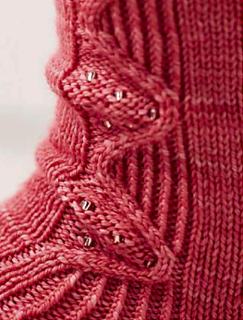 Combining twisted ribbing, cables and beading, these pretty socks by Jane Burns have a decidedly feminine feel. They’re knitted from the top down with a slip stitch heel; the twisted ribbing extends down from the cuffs along the outside edges of the socks. 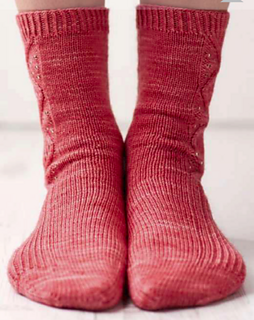 Jane has chosen a special hand-dyed yarn for her socks, which produces a subtle variation in colour on the fabric. It’s called Tough Love Sock from Vancouver artisan dyer Sweet Georgia Yarns, and is available in a range of beautiful semi-solid, gradient and variegated colourways.